Use this report to determine where to focus resources and remediation efforts, or identify administrators that require additional guidance. This report is composed of two pages, the Vulnerability Hosts Explorer page and the Vulnerability Hosts Trend page. To see the Vulnerability Hosts Trend page, click the arrow icon ( ) on the top right of the report. Click Vulnerabilities Analysis, and then click Vulnerabilities Host Explorer. To refine your findings, filter your report by Select Month, Customer Account, Deployment Name, and Asset Tags. This section provides the total number of hosts scanned in the selected month(s), the vulnerable hosts, and the percentage of vulnerable hosts. The section provides the total number of vulnerabilities found in the vulnerable hosts in the selected filters. 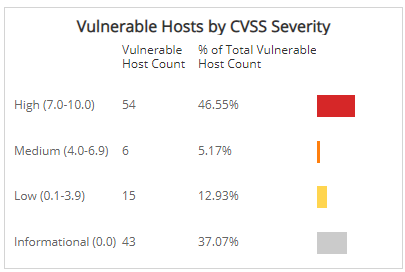 The chart also provides the count of vulnerable hosts and the percentage of vulnerable hosts within each category, and it displays a color-coded bar that represents the size of that severity. 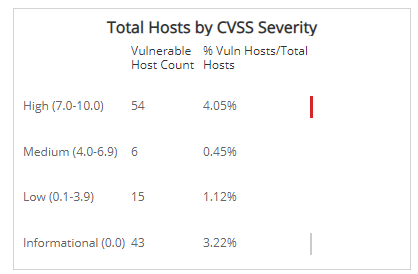 This bar chart categorizes the total vulnerable hosts in your environment by CVSS severity, provides the count of vulnerable hosts and the percentage of vulnerable hosts within each category, along with a displays a color-coded bar that represents the size of that severity. 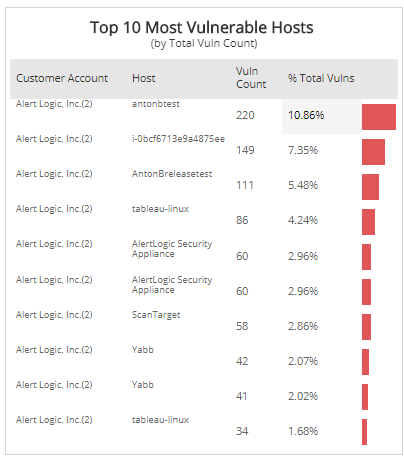 The list provides the 10 most vulnerable hosts based on the total vulnerability count during the selected month(s). The list is organized by customer account, host name, count of vulnerabilities, and the percentage of the total vulnerabilities count, along with a color-coded bar that represents the size of the vulnerabilities count. 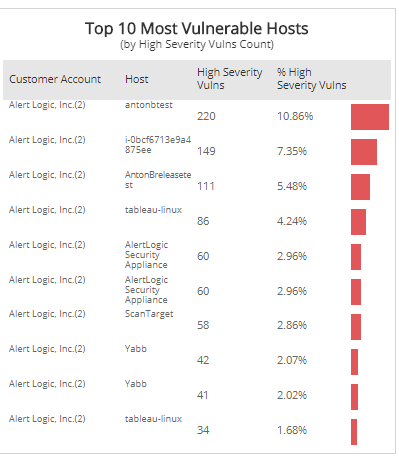 The list provides the 10 most vulnerable hosts based on the total high severity vulnerability count during the selected month(s). The list is organized by the customer account, host name, count of high severity vulnerabilities, and the percentage of the high severity vulnerabilities, along with a color-coded bar that represents the size of that severity. To see the Vulnerable Hosts Trends page, click the arrow icon ( ) on the top right of the report. These sections show the percentage or count, and trend of vulnerable host changes over the selected time period. You can display the data as a line or bar chart. Click the drop-down on the top right of the Vulnerable Host Count Over the Period section, and then select the chart type you want to see. This section shows the change in the total count of vulnerable hosts, and a graph that displays the monthly vulnerable host count trend change over the selected period of time. This section shows the total percentage change of the vulnerable hosts categorized as high severity and a graph that displays the monthly percentage trend change over the selected period of time. The section shows the total percentage change of vulnerable hosts categorized as medium severity, and a graph that displays the monthly percentage trend change over the selected period of time. The section shows the total percentage change of the vulnerable hosts categorized as low severity, and a graph that displays the monthly percentage trend change over the selected period of time.